The garage sale preparation has kept me far busier than I expected. Plus, I'm expecting company this weekend for Mother's Day. (And just in case you don't think that is enough to keep me busy, this week I babysat for my friend's sons, attended a Mother's Day tea party, and my husband was away on a business trip the past three days.) I will resume my normal posting schedule soon, I promise! Here's another holiday to squeeze in before Mother's Day -- have you heard about National Train Day? It's on May 7th this year. There are all sorts of train related events taking place and Amtrak is celebrating 40 years. 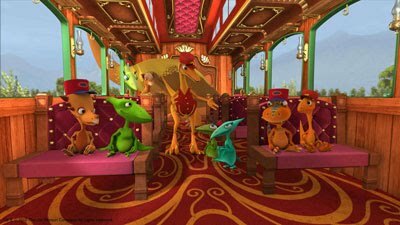 In “Junior Conductor Jamboree,” Buddy and his family ride the Dinosaur Train from one end of the line to the other and visit all three time periods--from the Cretaceous, through the Jurassic, to the Triassic. In “Troodon Train Day,” the Pteranodon family rides to Troodon Town to celebrate Troodon Train Day, where the main event is a concert by King Cryolophosaurus, giving his first performance in years! The main reason my son loves Dinosaur Train is because of the trains! He's not as much of a dinosaur fan, but he seems to learn plenty about paleontology from the show while looking for the train appearances. Thanks to PBS he had a chance to watch a screener of the new episode. Unfortunately I haven't had time to watch it yet so no review this time. And, be sure to take a look at the Dinosaur Train website this month. There's a new train-themed homepage, fun train printables, and an "All Aboard" online game.